As I mentioned in part one living with PCOS can be so hard. Today I am talking about issues with my weight and body image. It's a topic I've wanted to write about for awhile but I've been putting it off. Basically I am overweight and hate it! That's my feelings on it as I am sure that there are many people who are overweight and are comfortable. Being overweight for me is something I'm just not comfortable with I feel that people are judging me on a daily basis on what I wear and eat. My body hasn't always been like it is now I have been slim which was only for a short brief while, before having Blake when I lost 6 stone on slimming world. But most of my life I've been a size 18-20 and at my biggest as size 24. That makes me feel totally self conscious and in general I'm not an bubbly chatty person anyway. Losing weight when I have PCOS is hard work. I've had to ignore cravings for sweet foods and eat salads which I hate. I've had to try and ignore feeling hungry as I've eaten a lot and couldn't possibly really be hungry still. Over the years since my diagnosis I've read a lot of books and articles and learnt a lot about having the condition and I'm sure that there is so much I still don't know. -With PCOS you can have insulin resistance which means that your body needs more insulin than normal to deal with sugar in your blood stream. - Women with PCOS have been found to have a lower metabolic rate. - Research has shown that women with PCOS do not feel as full and as satisfied after meals than women who don't have the condition. With all that aside I'm sure you could maybe understand why the comment in the photo below "If you really wanted to lose weight you could" makes me so frustrated as the people who has said it to me, are ones that don't have the condition or even know much about it. Most days I look in the mirror and feel like crying as I am not happy with how I look. I find shopping for myself extremely hard as I see nearly everything I wear makes me look and feel fat. When I look at clothing I worry people will see what size I pick up and be secretly laughing,I worry that what I'm wearing makes me look bigger than I am. When I'm eating I worry that people are staring at me and secretly laughing inside. When I look in the mirror I see someone who needs to lose a lot of weight, someone who's hair is wispy and not thick and long as I want it to be, someone who has excess hair on my body that I have to remove constantly. I am trying to eat healthily and get the weight off but the scales just are fluctuating and I'm not actually loosing weight at all. It doesn't help that I also have thyroid condition which also makes losing weight a battle. It's easy to say keep trying, you'll get there eventually etc but it's not that easy. I'm so sorry that you feel like this. 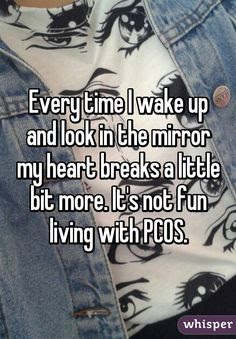 I don't have pcos myself but have close family members who do and so I really understand what you're talking about. It's great that you are writing about it to educate people and stop people assuming things that aren't true. I totally agree. Losing weight with PCOS is hard work. I have always struggles with this. 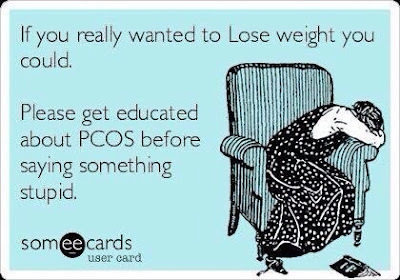 I know a couple of people who have PCOS and I hate seeing how much they suffer. Just know that you're beautiful and so strong! I can only imagine what a struggle it is for you. Wow this is a deep post. Good to see you are staying postive. Thank you so much for sharing your experience - living with PCOS sounds really hard - it's amazing you have the courage to share with others, but it's amazing as you'll help so many! Well done for talking about PCOS and telling everyone what's it's really like. I don't think there's enough awareness of it. 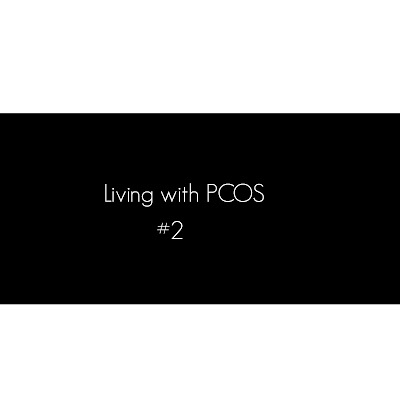 I'm so sorry that you have to live with PCOS. For what it's worth I think you look fab, but I can totally sympathise with it being hard to lose weight. :( stay positive and don't let the negative comments get to you. all that matters is that you are trying despite the struggle. My family has a thyroid condition so I feel your pain there. I'm currently in the position of looking in the mirror and being unhappy with how I look, the main thing is to try and stay positive! I have a few friends that are going through the same struggles. It's so hard, especially one of my friend that is completely infertile because of it. I too suffer from PCOS having been diagnosed over 15 years ago when I was a teenager. It is so hard and I have battled for years to loose weight and learn to love myself lumps and all. This must be such a hard thing to deal with. Don't let the negativity get to you, although that can be hard sometimes. Losing weight is always so hard! I can only imagine how hard it can be I am not overweighed but my mum was and she was getting really frustrated at times. She couldn't lose it.